TV footage showed Mickey Burke’s hand coming into contact with Dublin forward Eoghan O’Gara’s mouth. 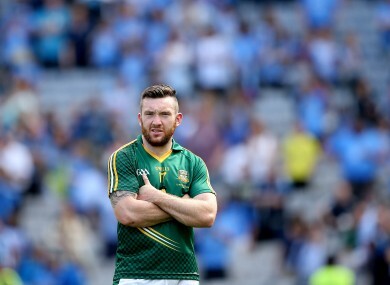 Meath’s Mickey Burke was one of the players at the centre of the controversy. THE GAA’S PROBE into allegations of biting during the Leinster football final have come to nought because of Meath’s decision not to pursue the matter. Meath and Dublin were informed on Tuesday evening that no charges would be brought against any Dublin player despite Meath manager Mick O’Dowd’s claims that defender Mickey Burke was bitten. TV footage and picture stills showed Burke’s hand coming into contact with Dublin forward Eoghan O’Gara’s mouth during a 63rd minute fracas. Burke subsequently approached referee Padraig Hughes and claimed that his finger was bitten. But while the experienced defender made a precautionary visit to Navan Hospital that evening, he refused to follow up with a formal complaint. Both Meath and Dublin were contacted on Monday and given 24 hours to make written submissions on the matter, which they both did. But following a meeting of Meath officials on Monday evening, it was decided not to pursue the issue and when Burke made a similar decision, the matter had to be dropped. It’s the second time in two seasons that allegations of biting against a Dublin player have come to nought because of a lack of evidence. During last year’s national league, Dublin’s Kevin O’Brien was issued with a proposed three-match ban for an incident involving Donegal’s Paddy McBrearty, though McBrearty chose not to give evidence to a hearing. Earlier this year, Dublin forward Jason Whelan received an eight-week ban for ‘inflicting injury recklessly’ following allegations of a bite during an O’Byrne Cup game. There is no guarantee, however, that O’Gara would have been sanctioned even if Burke had formally complained of a bite. Dublin chairman Andy Kettle confirmed the issue is ‘done and over with,’ though declined to comment any further. Dublin, who defeated Meath by 16 points, play an All-Ireland quarter-final tie on 9 August, while Meath are out on Saturday week in a final round qualifier against Armagh. Email “GAA probe set to end as Meath decide not to pursue biting allegations”. Feedback on “GAA probe set to end as Meath decide not to pursue biting allegations”.